A lecturer for the Mechanical Engineering Department since 1995, Ms.Coen-Brown has been teaching at the university for over 20 years in the area of engineering graphics and design. She works closely with freshman engineering students to help make their transition to college a successful one. A licensed professional civil engineer, Ms. Coen-Brown spent time in the private sector working with her family's consulting engineering firm. A member of Tau Beta Pi and Chi Epsilon, she also served as a board member for the University of Nebraska Engineering Alumni Association. Karen Coen-Brown has authored several popular textbooks dealing with CAD. She also takes an active interest in the International Highway Engineering Exchange Program. 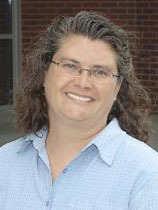 Ms. Coen-Brown is continually researching new computer technologies that can be applied to the various fields of engineering. She is always seeking fresh and innovative ways to share that cutting-edge knowledge with her students. Coen-Brown, K and Robinson, Rande, Understanding Microstation V8 XM® in 2D: A Basic Guide For XM® and V8i Users. Copyright 2009 by Stipes Publishing L.L.C. Coen-Brown, K., Understanding MicroStation/J ® A Basic Guide to MicroStation/J ® 2D Drawing and 3D Modeling Using SmartSolidsTM. Copyright 2001 by Prentice-Hall, Inc.
Coen-Brown, K., Understanding MicroStation 95/SE: A Basic Guide to MicroStationTM, MicroStation ModelerTM, and MasterPieceTM. Copyright 1999 by Prentice-Hall, Inc.
Coen-Brown, K., "Analysis of a Shallow Spherical Shell under a Modified Point Load on the Edge," M.Sc. Thesis, 1989.